You are more unaware of how much salt you are eating than you think you are! The American diet is loaded with sodium from all the processed foods we tend to eat. Frozen meals, which are marketed at busy families who want something quick to make for dinner, are often full of sodium. Sometimes one serving of a frozen macaroni and cheese can have as much as 30% of the daily amount of sodium recommended for a person. We all know that no one ever eats a single serving of macaroni and cheese. Eating these foods occasionally is okay, but there are many college students and single parent families that rely on these meals nightly. Cooking fresh food is the best way to control how much sodium is in your diet, and seasoning food without salt is another good helper. When you begin cooking without salt, at first it may seem a little intimidating. Some people have become habitual salters- adding the mineral without tasting the food first, or worse yet, adding it simply because it is what they have always done. Do either of these scenarios describe you? A lot of mainstream recipes use salt to improve flavor or reduce bitterness of a dish, but they forget about all the other beautiful spices available to delight the senses. Salt has become a real catch all for improving flavor, much to the dismay of chefs all over the world. Herbs and spices are perfect for boosting your food’s flavor and giving you a better experience. These boosts can help you truly enjoy your food. If you stop and eat slowly, you will discover that your food tastes so much better than you ever thought it could. There is no spice that exactly imitates the way salt tastes, but there are some that have similar profiles, which can be akin to salt. 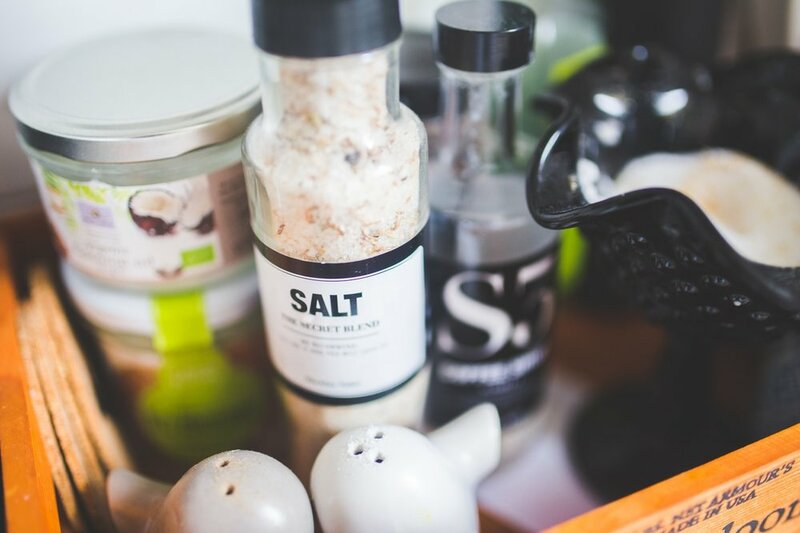 When looking for salt substitutes, one of the first things people tend to encounter is the suggestion that lemon juice can replace salt in a lot of recipes and people will frequently say that these dishes taste better than their saltier counterparts. It is thought that salt brings out the flavor of food by tying up the water in the food elsewhere- so your tongue can easily taste the enhanced flavors of the food without being distracted by the water content. Lemon juice acts similarly, but it can only be used in certain dishes. Instead of worrying about what spices taste like salt, you could try our Salt Free spice Blends that will instead make your food more flavorful in different ways. You may find you prefer these in comparison to salt. These spices are great for starting out with, plus they are approachable and for the most part familiar to your mouth already. This will help you ease into seasoning without salt. If you are curious about what spices have a salty taste, the answer is that none of them do, really. The spice blends we have for use as alternatives are those which enhance the dish and give good flavor boosts, eliminating the need to add salt to the dish altogether. If you are still hesitant about adding your own combination of spices to your food, you could try out some our spice blends to give yourself a feel for the complex flavors available to you. As with all thing’s food, experimentation and patience is key. It will take time for your palette to cleanse itself of the desire for a lot of salt, but the time is worth it. When you open yourself up to the vast world of spices, you find that there are so many interesting flavors out there. It is especially wonderful when you find a combination that you absolutely love and can go back to over again, without worrying about salt. Josephine’s Pantry has an incredible line-up of Salt Free Blends that will open your palate to a world of delicious flavors. Here is a list of our all-star Salt Free blends. This blend is incredible on Poultry anyway you prepare it. It’s herby with sweet citrus flavors featuring lemon zest and granulated honey. Best of SALT FREE!